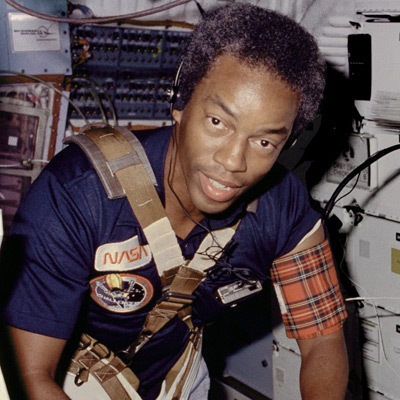 November 22nd in African American History - Guion "Guy" Bluford, Jr.
November 22nd in African American History – Guion “Guy” Bluford, Jr.
November 22, 1942 Guion “Guy” Bluford, Jr., engineer, Air Force colonel and astronaut, was born in Philadelphia, Pennsylvania. Bluford earned his Bachelor of Science degree from Pennsylvania State University in 1964, his Master of Science degree and Ph.D. from the Air Force Institute of Technology in 1974 and 1978, respectively and his Master of Business Administration from the University of Houston in 1987. Bluford earned his pilot wings in 1966 and flew 144 combat missions, including 65 over North Vietnam. He became an astronaut with the National Aeronautics and Space Administration in 1979 and served on four space missions, logging more than 688 hours in space. Bluford left NASA in 1993 and is currently president and general manager of Aerospace Technology, an engineering consulting organization. Bluford was inducted into the International Space Hall of Fame in 1997 and the United States Astronaut Hall of Fame in 2010.